Widely regarded as the most popular classical voice in the world, legendary Italian singer Andrea Bocelli will be performing with the SF Symphony and Chorus at San Francisco’s new Chase Center, December 5. 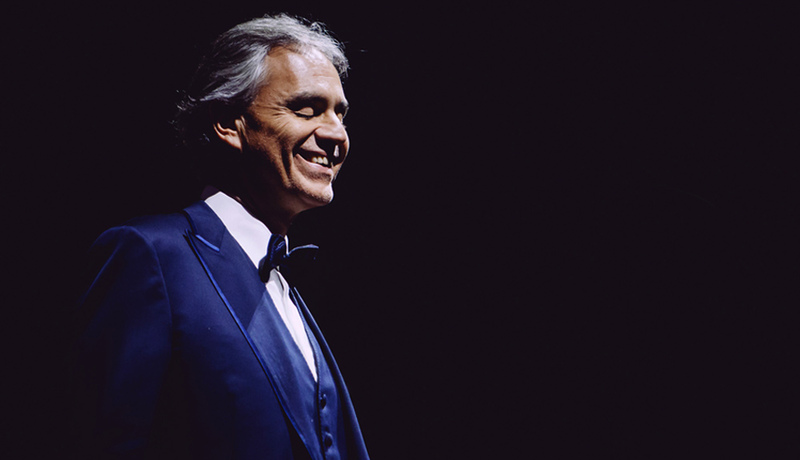 Kicking off his 2019 tour, this performance marks Bocelli’s first-ever appearance in the city of San Francisco and his debut with the SF Symphony. Experience Bocelli fill the arena with his soaring arias, famed love songs, and other masterpieces from his unmatched repertoire, along with music from his newest release and Billboard chart-topping record Sì. The Chase Center, a new 18,064-seat privately financed sports and entertainment arena in San Francisco’s Mission Bay neighborhood, is the new home of the back-to-back NBA Champion Golden State Warriors. Presale tickets for SF Symphony subscribers and donors will be available Monday, April 1 at 10am. Tickets to all SF Symphony patrons will be available Monday, April 8 at 10am. Includes access to an exclusive rehearsal with Andrea Bocelli and the San Francisco Symphony, a private pre-concert cocktail reception, and one (1) reserved floor seat in the first 11 rows. Includes an exclusive pre-concert cocktail reception and one (1) reserved floor ticket in the first 17 rows. Please note that tickets for this concert will ship at a later time and will arrive no later than 30 days prior to concert.